Craftin' Caro: "Christmas Lane" Kit & Stampin' Palooza! "Christmas Lane" Kit & Stampin' Palooza! When planning for our upcoming October 1 Fall Stampin' Palooza event, we were intrigued by the possibility of offering you something different by way of projects this time. 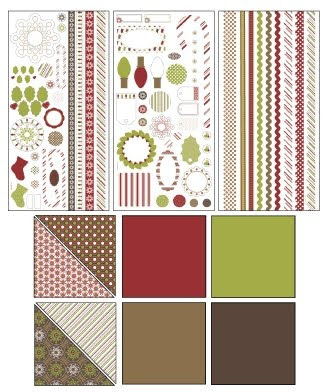 When we came across the new "Christmas Lane" Simply Scrappin' kit in the Holiday Mini Catalogue, it was like a lightbulb went off over our heads. We could use one of these fabulous kits and show you how to make over 20 great projects with them - easier than you would believe! We got even more excited when we thought of all the super cool accessories we could use to embellish the projects too, like the 3/8" Cherry Cobbler Quilted Satin Ribbon, the mini Jingle Bells, Kraft Gift Boxes and neat Mica Flakes. We think this will be the BEST 'Palooza event ever and are so excited to be seeing many of you in less than a month. You can purchase tickets online or by contacting me directly, but we've capped the registration at only 60 attendees to make sure everyone has lots of space to play and socialize!